Description : Floplast Cast Iron Effect 112mm Black Half Round 2m Gutter Flow Rate when guttering fitted at 1:350 fall When outlet fitted at the end of gutter run - 1.17 L/s When outlet fitted to centre of gutter run - 2.6 L/s Colour : Black - Cast Iron Effect Finish Delive.. Description : Floplast Cast Iron Effect 112mm Half Round Black 4m Gutter Flow Rate when guttering fitted at 1:350 fall When outlet fitted at the end of gutter run - 1.17 L/s When outlet fitted to centre of gutter run - 2.6 L/s Colour : Black - Cast Iron Effect Finish Delive.. Description : Floplast Cast Iron effect 112mm Black Half Round 135º Gutter Angle (internal/external) Colour : Black - Cast Iron Effect Finish Delivery : 2 - 4 working days .. Description : Floplast Cast Iron effect 112mm Half Round Black 90º Gutter Angle (internal/external) Colour : Black - Cast Iron Effect Finish Delivery : 2 - 4 working days .. Description : Floplast Cast Iron Effect 112mm Half Round Black Gutter Fascia Bracket (place at max 8 metre centres) Colour : Black - Cast Iron Effect Finish Delivery : 2 - 4 working days .. Description : Floplast Cast Iron Effect 112mm Gutter Union/Joint Colour : Black - Cast Iron Effect Finish Delivery : 2 - 4 working days .. Description : Floplast Cast Iron Effect 112mm Half Round Black Gutter In-Line Running Outlet Flow Rate when guttering fitted at 1:350 fall When outlet fitted at the end of gutter run - 1.17 L/s When outlet fitted to centre of gutter run - 2.6 L/s Colour : Black - Cast Iron Eff.. Description : Floplast Cast Iron Effect 112mm Half Round Black Gutter External Stop End Colour : Black - Cast Iron Effect Finish Delivery : 2 - 4 working days .. Description : Cast Iron Effect 112mm Black Half Round to Cast Iron Ogee Right Hand Adaptor Connects new plastic cast effect guttering to most cast iron ogee gutter systems (needs silicone to form a seal) Colour : Black - Cast Iron Effect Finish .. Description : Cast Iron Effect 112mm to Cast Iron Ogee Left Hand Adaptor Connects new plastic cast effect guttering to most cast iron ogee gutter systems (needs silicone to form a seal) Colour : Black - Cast Iron Effect Finish Delivery : 2 - 4 working days .. 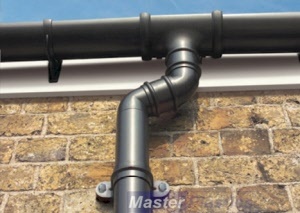 Description : Floplast Cast Iron Effect 112mm Black Half Round to Cast Iron Half Round Adaptor Connects new plastic cast effect guttering to most cast iron half round gutter systems (needs silicone to form a seal) Colour : Black - Cast Iron Effect Finish Delivery : 2 - 4 work..